Amish Wagon Works: Roller Racers for Rolling Races! Be the first to get the the Roller Racer, and watch all your neighbors get them too! This unique toy was designed by a retired Boeing engineer for his grandson, and is exceptional for its safety and speed. This toy is propelled by rapidly oscillating the handlebars, so no pedaling, motors, or batteries required! The center of gravity on the Roller Racer is low, and there are no hard edges, making it one of the safest ride-on toys available. But it is fast! The wheels are designed for any hard surface, and will not damage hardwood floors. Roller Racers can be used for obstacle courses, races, and even playing bumper cars. They are that safe! But what really sets the Roller Racer apart is its easy adaptability for special-needs children who might not be able to ride a tricycle. The Exer-Rider Model comes equipped with a seatbelt and footstraps, as well as having a back-supporting seat. This model was designed by a pediatric physical therapist, and can be used by children with a variety of diagnoses. Of course, be sure to consult your child's doctor before purchasing. 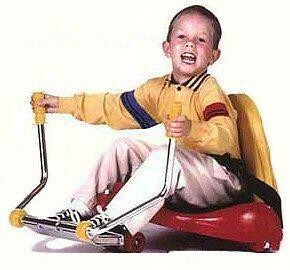 ﻿ By your child his very own Roller Racer today, and watch him smile as he rolls away!